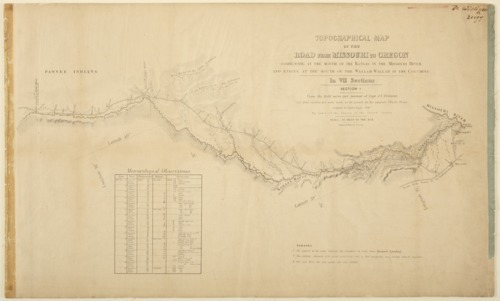 Part one of an Oregon Trail map compiled by Charles Preuss and based on the field notes and journal of John C. Frémont. It is the first of seven maps bound together in a booklet and submitted to the U.S. Congress as a report. This page follows the Kansas and Little Blue rivers into present-day Nebraska. Recorded on the map are the route of the Santa Fe Trail, good places for drinking water, and locations where elk and deer are scarce. Map maker Charles Preuss worked as Frémont's assistant on the expedition, producing sketches and notes that he later used to create this series of maps. Creator: E. Weber & Co.